Montreal in Mario is Missing! Montreal is the largest city in the Quebec province and one of the most populated cities in Canada (second to Toronto). It is also one of the locations raided by Bowser and his Koopa Troopas in the NES version of Mario is Missing!, with its portal in Bowser's Castle being next to Moscow. While the Koopa Troopas are causing chaos, they steal a Stone from Mount Royal, the Dome of Saint Joseph's Oratory, and the Tilted Tower from the Olympic Stadium. 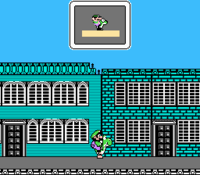 After arriving in the city, Luigi takes back the items from the Koopa Troopas, asks the locals various questions about them, and promptly returns them to their rightful places before leaving. "Here’s a fact that curled my hair: it’s the second largest country in both hemispheres." "The Queen of England is also Queen here in Canada." "You’re pretty far north in North America." "We drove all the way across America from Mexico to visit Canada, land of the maple leaf." "Montreal is an island in the St. Lawrence River." "French and English are both spoken here, but French is the official language." "You’re in the second largest city in the world’s second largest country." "Montreal, Canada is the largest French speaking city outside of Paris." Footage of Montreal appears in the files of Mario is Missing! 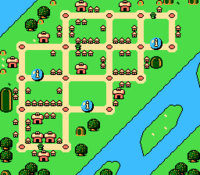 's Deluxe version, depicting the NES version's landmarks alongside the Notre-Dame Basilica. This page was last edited on March 29, 2018, at 13:23.